Bring your car to a full stop. 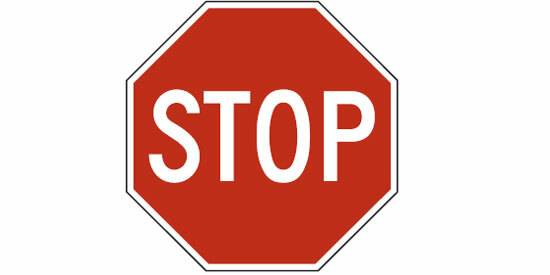 Stop only if a red light is showing. Stop only if there is a painted stop line. Slow down or stop, if necessary. 3. All of the following are dangerous while driving. Which is also illegal? Having one or more interior lights on. Wearing a headset that covers both ears. Use cruise control in residential areas. Illegal when a hands-free feature is used. Legal for anyone during hazardous conditions. Illegal when you are a minor, unless there is an emergency. Legal for anyone, if you do not use it for text messaging. No more than three seconds. 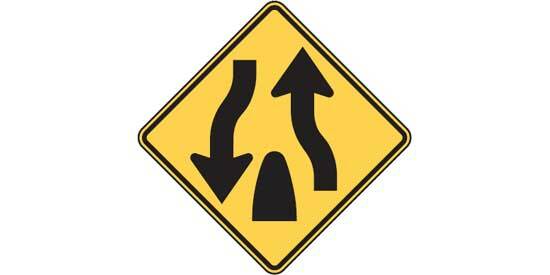 There is no gap for other drivers when merging. Your headlights may blind the truck driver. You take away your own cushion of safety. It makes the pavement more slippery. 8. Why should you be particularly careful when passing a large truck going down a long or steep hill? The truck will often weave back and forth between lanes. The truck may need to swing wide. The truck can gain speed very quickly. 9. What does this sign mean? In no situation, it confuses other drivers. When it helps to prevent a collision. When arriving at an uncontrolled intersection. Stop and leave a note with your name and address. Stop and move the animal to the side of the road. Never drive in the bicycle lane. 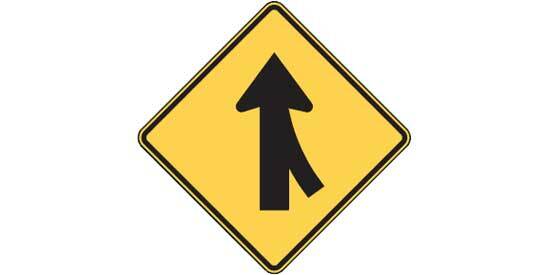 Merge into the bicycle lane before making your turn. Only merge into the bicycle lane if you see a bicyclist. 13. What is true about large trucks? They have smaller blind spots than most cars. They have shorter stopping distances than most cars. They need more room to maneuver. You must slow down before entering the intersection. After stopping, you may proceed straight ahead, if safe. After stopping and yielding, you can make a right turn. After stopping and yielding, you can make a left turn on any street. 15. What is true about drugs and driving? Alcohol taken together with drugs reduces side effects. It is illegal to drive when your ability to drive safely is impaired. A physician must tell you if a drug affects your driving. Pep pills are always safe when driving long distances. Looking over your right shoulder. Step firm and hard on the brake at all stops. Turn the wheel sharply and firm at all turns. Accelerate quickly after a stop. Stop, listen, and proceed cautiously. Look to the sides of your vehicle and be prepared to stop. 19. A traffic light shows a red signal, but a peace officer signals you to proceed. What should you do? Wait for a green signal. Proceed without reducing speed, even if a stop can be made safely. Stop, if you can do so safely. Slow down and yield to all pedestrians. Insist on the right-of-way to avoid accidents. Drive closer to the center of the road. Slow down to 30 mph or less. Focus on the center line on the road. Look to the right-hand edge of your lane. Look straight ahead until your eyes recover from the glare. 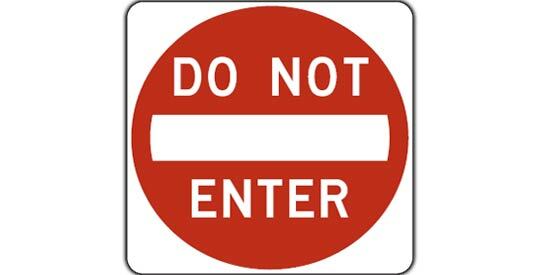 A roadway that must not be entered. 26. You see a street car at a marked safety zone ahead. When are you allowed to drive through the safety zone? When the streetcar starts moving. When you slow down to 10 mph. When no pedestrians are present. You must come to a complete stop. Proceed only when safe. The road is closed to traffic from all directions. The road is closed to traffic from your direction. Is the cause of most rear-end accidents. Makes it easier to see hazards in time. Rely on your side view mirrors. The local police or CHP. California Permit Practice Test - 3 You got %%score%% correct answers of %%total%%. %%details%%. More than one-third of young permit test takers in some California districts either flunked or gave up during their examination in 2016. New and better questions encourage to think through scenarios instead of simply regurgitating facts. Even if California DMV want new drivers out there and want teenagers to pass the test, officials emphasize that a learner’s permit or driver’s license is a great responsibility. Therefore, any applicant need to study the safe driving techniques and the rules of the road. Think you can skip the California driver handbook and that it is all common sense? Then you probably ignore the fact that the DMV written test is designed to be an important incentive for you to learn rules and safe driving. 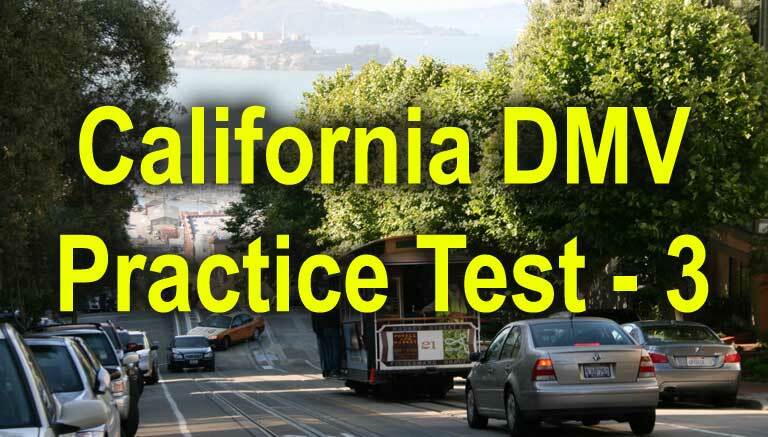 Test are the DMV’s means of making sure you have read the California Handbook and learned everything you need to know to be a safe driver. You can be sure that everything on the California written test is taken from the handbook. DMV also focus specifically on your understanding of the specific California rules and laws. Questions are often designed to match the exact phrasing in the driver handbook. Common sense? Yes, for some. And for others, perhaps not. You could argue that there can be no common sense without real knowledge. How many California permit practice tests do you need to take? Well, it is different from person to person. If you use the California permit practice tests to memorize answers, there are probably not enough practice tests on this website. You are also likely to fail the real test. Try to put your anxiety in the backseat while you study. Donâ€™t focus too much on the real exam. Isnâ€™t your goal to become the best and safest driver you can be? To achieve this goal, you need to study and you need to learn. Read some parts of the handbook every day. Keep your mind on what you are reading. Then take a practice test. The test will measure your progress. Learn from any mistakes or errors. Go back to the handbook and check facts. Repeat this for at least two weeks. You will quickly realize that you master more and more of the contents. The real California DMV test has a passing score of more than 80%. You should make sure your practice score reaches at least 90%. Even better, strive to get 100%. Challenge a parent or other adult to take a permit practice test with you. There is no doubt that even licensed drivers could learn a lot by reading the driver handbook and taking practice test. Many things change over the years. Driver experience makes up for some shortcomings in knowledge about rules, but refreshers help make all of us better drivers. Often, we learn the new things that we didnâ€™t know about. If you have a parent or adult around, you might want to ask about how you place your hands on the steering wheel (Chapter about â€˜Steeringâ€™ in the handbook). They will probably tell you that they learned something completely different when they studied for their learnerâ€™s permit. Be the first to comment on "California Permit Practice Test – 3"